President Elect's official projection of the 2012 Electoral College vote pitting President Barack Obama against Republican challenger Mitt Romney shows that the Democrats will win a second term in the White House for just the second time in the last sixty years. 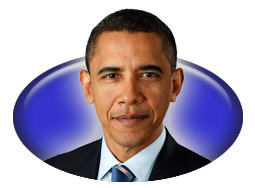 President Elect projects that Obama will win 281 electoral votes and Romney will win 257. But there are some major caveats. This site started in 1999, and this is the first election since then that I am not 100% confident in my selection of the winning candidate. First of all, this race appears to be very close. I could get 49 out of 50 states right and still end up being wrong about the winner. And there are several states where a switch is very possible. This entire race is a tossup. Not only that, enough states are up for grabs that despite how uncertain things are if one or the other candidate picked up a large number of those states the final electoral tally could look more lopsided than expected. Secondly, there seems to be a disconnect between the national and state polls. Others have noted this as well. Even among different polls of the same type there has been a lot of disagreement. It's hard to know which ones to trust. Republicans have been arguing that pollsters are oversampling Democrats. While Democrats have complained about other methodological problems. RealClearPolitics has a happy medium, averaging the polls to get a single state number and a single national number which hopefully smooths over the issues. But even then a huge outlier from Podunk University Polling ruins the average. Whatever the cause, if something is wrong with the polls you can't trust any analyses that uses them. Garbage in, garbage out. There is another alternative. Perhaps the disparity in the polls, the closeness of the race, and, yes even my prognosticating gut, are indications of another popular vote / electoral vote split. If that were to occur this year it could go either way, but my best guess is that this time it would go against the Republicans. So what's my final word? I'm going with the numbers, with the understanding that I don't completely trust them! This election is going to come down to turnout. If turnout is as expected or lower, Obama wins. If, as I think might happen, Republican turnout is more than the polls indicate, Romney could surprise us. As for the final analysis, things are still very fluid with several states still impossible to confidently call. Colorado is a virtual tie and is placed on Romney's side more due to momentum there than anything else. New Hampshire has tightened up in the final days but will probably end up in the Obama column. If Romney had showed up in Pennsylvania a week or so earlier maybe it could have been a more possible takeaway, but it is still surprisingly close. The Obama camp has closed the gap considerably in Virginia but will it be enough? And the same question can be asked of Romney in Iowa. And finally, Ohio. Obama's lead has been very consistent, but not often above the margin of error. I don't think I'm going out on a limb saying the winner of Ohio wins the election. Which is probably why it might not be decided on election night itself. 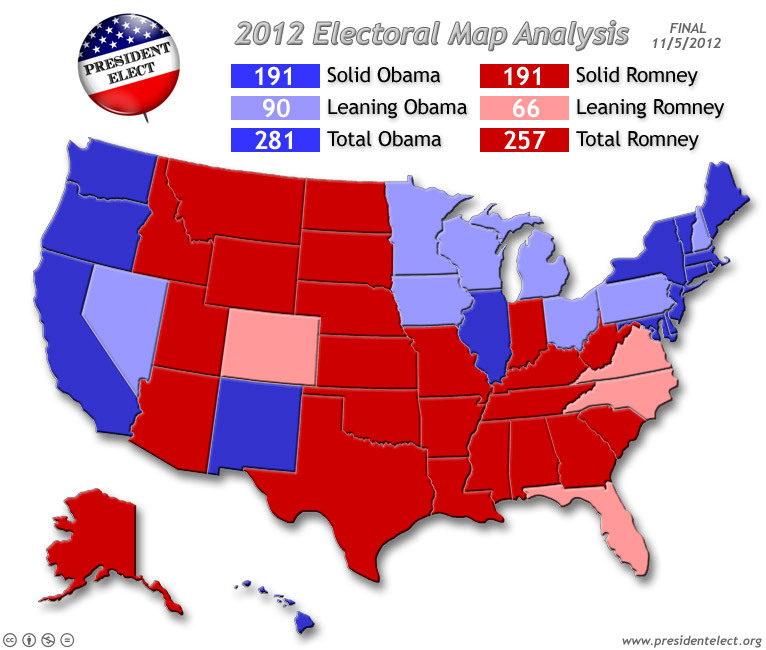 The only change in this final map from last week is Minnesota moving from solid Obama, to leaning. However, the lean is just barely enough to qualify and I don't expect it to be in play. Thanks for following along this election season! 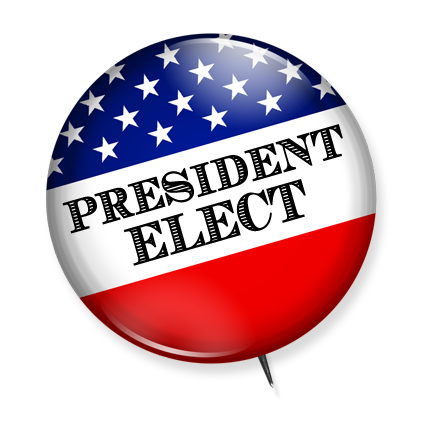 Be sure to visit on election night for my quadrennial live blog of the results. I'll be keeping track of the results (on a map in a much more useful manner than you'll see on your TV), answering your questions, and probably pulling my hair out trying to parse the numbers!